The world’s oldest intact working lighthouse has announced that from mid-July 2017 Hook Lighthouse will offer sunset tours. The brand new Sunset Tour experience offers visitors the opportunity to take a guided tour up the 115 well-worn steps of the medieval tower and see it’s heritage come to life as they meet life sized figures of the Monk who first established the beacon at the site in the 5th century followed by the Knight who built the tower; William Marshal some 800 years ago and hear of life as a light-keeper before stepping on to the top floor outdoor balcony to take in the 360degree sweeping views of the Southeast of Ireland. Tours culminate with the spectacular panoramic views of the rolling seas stretching out while visitors savour Irish mead, prosecco, fresh tea and coffee along with Ballyhack smokehouse smoked salmon on homemade brown bread, a selection of homemade canapés and homemade mini desserts while visitors enjoy the stunning sunset from the lighthouse watch room and balcony. The Sunset Tour Experience will be on offer at 8pm on Mondays, Wednesdays and Fridays until the end of September 2017. 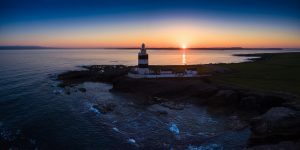 General guided tours are on offer 7 days a week at Hook Lighthouse sharing with visitors one of the greatest experiences on Ireland’s Ancient East. Sunset tours are available by advance booking only. Sunset guided tours at Hook Lighthouse are the perfect opportunity for a private tour, corporate occasion or a family day out. The sunset tours will only operate at a minimum of 12 persons or a maximum of 24. Pre-booking is essential and can be done so by emailing Cathy on info@hookheritage.ie or calling 00 353 (0)51 397055. Free facilities at Hook Lighthouse in county Wexford include parking, toilets, garden picnic areas, Wifi. Follow Hook Lighthouse on Facebook and twitter @hooklighthouse.